Everything you should know if you rent out residential homes for short-term holiday lets in Mallorca and Palma: the current, up to date regulations, concepts, legal and technical requirements that you must meet, the restrictions, the procedure to register your tourist accommodation and many other things. If you rent your home for tourism or vacation purposes in the Autonomous Community of the Balearic Islands or if you are thinking of doing so, this guide will provide you will all the essential information. Estancias turísticas en viviendas (ETV) refers to the types of residential properties that are legally permitted, and licenced, to be marketed as holiday rental accommodation. When is a property considered to be an ETV and will the Balearic Tourism Law and other tourist regulations apply? for periods of short duration, for days or weeks (maximum one month). It is no longer possible to use the law related to long term rentals (LAU) as a loophole for seasonal rentals as an alternative to tourist rental. Any residential property that is rented out for periods of one month or less, and which the owner cannot prove that the purpose of the rental is different to tourist use, it is assumed that it is a holiday rental activity and, as such, the laws relating to ETV holiday rental licences must be applied. To rent out a residential property without submitting the “declaración responsable” or meeting the regulatory requirements as stipulated in the Decree 20/2015 or the Regulations will be considered a serious infraction of the laws. What types of properties can be licenced as vacation rentals? In the Balearic Islands, until July 31, 2017, the current norm (Law 8/2012, of July 19, of the tourism of the Balearic Islands) regulated the tourist stays in dwellings of residential use by typologies, that is to say, it established in what types of housing the activity could be carried out with the specifications of Decree 20/2015, of 17 April. These specifications are made without taking into account the type of land use where the buildings were located and excluding “multi-family dwelling” namely apartments. The new Tourism Law does not distinguish between types of housing. That means that, at least in theory, any property is eligible for vacation rental, provided that it complies with the requirements established by the Balearic Law and other applicable regulations. Therefore, also the residential dwellings subject to the regime of horizontal property or multi-family buildings. However, in practice, rent in multi-family buildings is still prohibited in the Balearic Islands. What are the main differences between the different modalities of ETV? They can be rented out all year round. o it is the only property on the plot where it is located. Independent dwellings that are located in multi-family buildings (apartment blocks and flats) subject to the horizontal property regime are not considered single family homes. The single-family homes “entre medianeras” are properties that share a common side wall with other properties, i.e. linked villas or semidetached properties. However, the property must have its own plot (parcela). The “pareada” property which is similar to a property “entre medianeras” as outlined above but shares the same plot with the other properties. i.e. within a community of properties i.e. townhouses. 2. ETV365-Pluri: Tourist stays in multi-family dwellings. The licence for ETV365 properties expires in 5 years and is renewable. ETV365 properties can be rented throughout the entire year. 3. 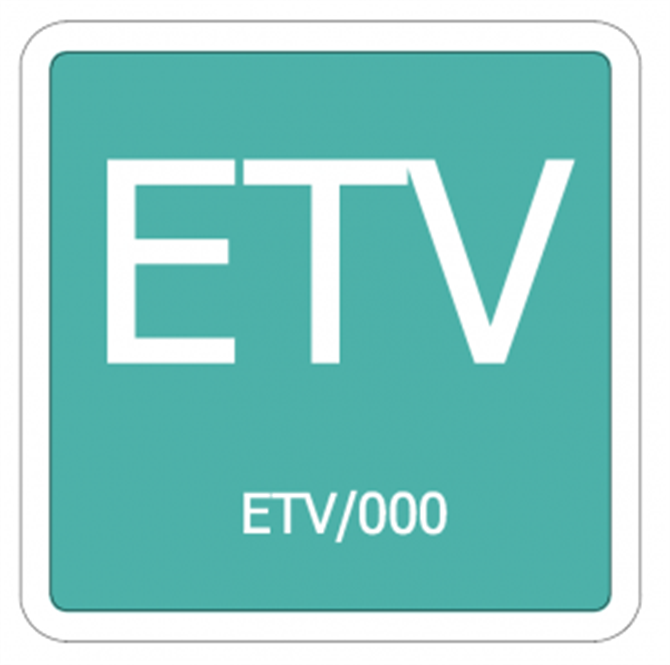 ETV60: Tourist stays in main residence properties (single-family and multi-family dwellings). They are the properties where the owner is registered (in the empadronamiento) as living in the property. These types of properties can be rented out for a maximum period of 60 days per year. The licence expires in 5 years and is renewable. When you rent your home per season, according to the provisions of Law 29/1994, of November 24, Urban Leases, with different purpose other than tourist use. When the stays are not of short duration. That is, when the rental period is longer than 1 calendar month. When your property is offered free of charge i.e. to friends and families. ·The exchange of holiday rental homes. The “tourist offer channels“ (canales de oferta turística) are defined as any method by which a physical person or legal entity, markets, advertises or provides (directly or through third parties) the reservation of tourist stays in homes either for short term periods (days or weeks) with the established limit of duration as outlined in in article 50 of this law, and additionally may provide some of the services provided in article 51 of the same. Tourist offer channels are, amongst others, travel agencies; booking sites; other companies or organization offering tourist services, including via the Internet or other tech or communication technologies; real estate agencies; as well as the insertion of advertising on social media, irrespective of its type or support. When the property is or has been subject to official protection. When your home is located on protected rustic land. 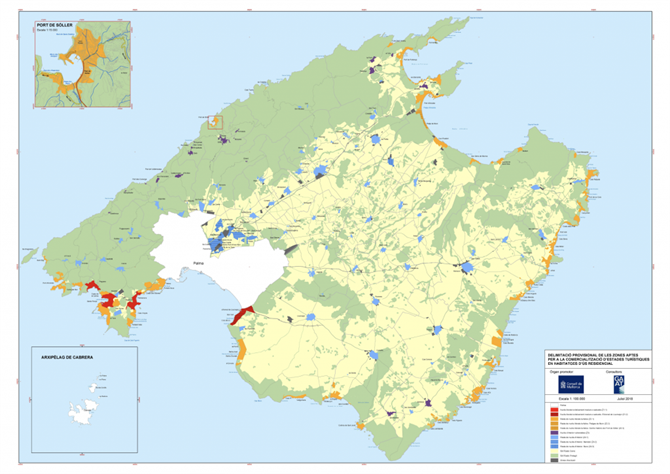 When the Intervention Plans in Tourist Areas – PIATs (Planes de Intervención en Ámbitos Turísticos) or the Insular Territorial Plans – PTIs (Planes Territoriales Insulares) of each island prohibits or restricts the rental of property. When a firm sanction has been imposed on you (relating to the property) for serious or very serious infringement of the holiday rental laws, as long as that legal right to rent out the property has not restored. When prohibited by the homeowners' association (comunidad de propietarios) does not permit holiday rentals, in the case of properties that are subject to the horizontal property regime. When the accommodation is not offered in its entirety. It is forbidden to rent rooms. What is the maximum number of holiday rental properties you can own? The maximum number of properties that are owned by one person, group of owners, or holding company that can be legally rented out is 3 properties or less. In what areas is tourist rental not allowed? Although now any type of housing can be used for holiday rentals, it is necessary that these are in "suitable areas" in accordance with the urban planning of each island. Who decides which areas are suitable for tourist rental? The suitable areas where you can carry out the tourism activity will be provisionally agreed, by agreement of the respective Plenums of the Island Councils (Plenos de los Consejos Insulares) of Mallorca and the City of Palma. Subsequently, it will be included in the Plans of Intervention in Tourist Areas (PIAT) and Insular Territorial Plans (PTI). This operation is called "zoning". In addition, the Insular Councils are able to determine not only the suitable areas, but also the allowed typologies, in such a way that it is possible that in one area a certain type of ETV is allowed and in another not. What was the criteria by which the suitability of an area for holiday rentals determined? Tourist zones, and their restrictions were established based on environmental, population, spatial planning criteria, and others that correspond to the level of tourist influx that the island can support without significant repercussions on its resources, management capacity and quality of life of the local residents. When was the establishment of tourist zones created? The Balearic Tourism Law set a period of 1 year to establish the tourist zones in each island (and the city of Palma) from August 1, 2017, date in which the latest holiday rental licence laws came into effect. During this one-year period, the issuing of new holiday rental licences was suspended until July 31, 2018. What happens if you already have a registered holiday rental property that is now located in a zone classified as unsuitable for holiday rental properties? If you already exercised your activity legally before the entry into force of Law 6/2017, of July 31, you will not be affected by the zoning. If at the time of entry into force of the Law of Tourism you were in the process of applying for your tourist license and, had submitted paperwork, your rental licence will be issued in accordance with the regulations in force at the time of submission of the request. What is the number of tourist places you can buy? Tourist licences are now being sold via the Holiday Rental Licence Stock Exchange Consortium – “Consorcio Bolsa de Alojamientos Turísticos” (CBAT), located in Balearic capital city of Palma. The licences are sold based on the accommodation capacity of the property. The number of places that a home can buy is determined by the number of places established by the occupancy certificate. There are currently 43,000 plazas available to purchase. Here’s a detailed article how to apply for, and purchase, rental plazas for your holiday rental property. What is the price of tourist places? For a house in a single-family building (ETV365) the price is €3,500 per plaza. For a multi-family building (ETV365Pluri) the price is €875 per plaza. For the modality of commercialization of main house for a maximum of two months the year (ETV60) the price is of €291.67 per plaza. Is there a maximum number of licenses per island? Yes. For the first time, a real ceiling of tourist places is established. That is, a maximum number of tourist places available on each island is established, so that once reached, new licenses cannot be granted even if you meet the other requirements. Is it possible to exchange plazas? The law previously allowed an exchange of 2 plazas for 1. When, and if, the government increases the total number of plazas available on the island. What is the current situation in Mallorca and Palma (2018)? What is the offer of plazas in Mallorca? In Mallorca, the current holiday rental offer can be expanded by 20,000 plazas and a maximum limit of 10,000 plazas in hotels and other tourist accommodation establishments. In the first 10 days after the plazas went on sale, 616 applications were made, accounting for 2,999 "plazas". Nearly 80% of them were for apartments. 14.1% (67) of the applications were for villas, accounting for 424 "plazas" and the remaining 6.3% (32 applications) were for main residences that would be rented for max. 60 days a year, which account for 189 "plazas". A maximum of 20,000 "plazas" are available for holiday rentals with a further 10,000 available for hotels. The purchase of plazas for tourism marketing of homes can be made from the approval of the zoning of the City of Palma and the Council of Mallorca. On 3rd July 2018, the board of the Tourism Stock Exchange (Bolsa) Consortium approved the number of plazas available in Mallorca and the price to purchase the plazas. The number of plazas per property is fixed by the Certificate of Occupancy – la Cedula de Habitabilidad. Once the first payment has been made, the interested parties will have to present the responsible declaration of initiation of tourism activity (DRIAT) duly completed and accompanied by all the required documentation to the Tourism Ministry - la Consejería de Turismo. All these requirements must be met in order to rent out a property for short term holiday lets. Owners who do not fulfil all the requirements of the DRIAT and the purchase of plazas may be fined or penalised for illegally renting out their property. Is there a provisional zoning for the commercialization of holiday lets in residential properties? The Plenary Session of the Council of Mallorca, in session of July 27, 2018, has adopted the agreement to definitively approve the provisional delimitation of areas suitable for the commercialization of holiday lets in residential properties in Mallorca (Excluding Palma). For the first time, holiday rentals are now legally permitted in apartments, although not in all areas. In some areas that are considered the most “saturated” with tourists, only the main residence (where the owner is registered as living) can be rented out, for a maximum of 60 days per year, and only during July and August. Under this regulation, in zones that have been classified as “mature tourist areas” of the island, properties are limited to a maximum of 60 days rental per year, with half (30 day) only in July or August. This is the case, for example, of the Playa de Palma, where the City Council had originally announced a total ban on holiday rentals, although it has subsequently rectified and allowed the lease of single-family homes (villas only) for 60 days a year, 30 of them outside the summer period of maximum occupation (July and August). Defined by their saturation level of tourism activity. Holiday rentals are permitted in both villas and apartments, throughout the entire year. Properties can be rented out for a maximum of 60 days per year. Areas that are not considered to be saturated with tourism activity. No new holiday rental licences are not being issues except in extraordinary circumstances outlined in the PIAT or PTI. Holiday rentals only permitted in main residence properties where the owner resides, with licences renewable every 5 years, for a maximum period of 60 days per year. For environmental reasons and/or public safety, these areas are considered not suitable for holiday rentals. 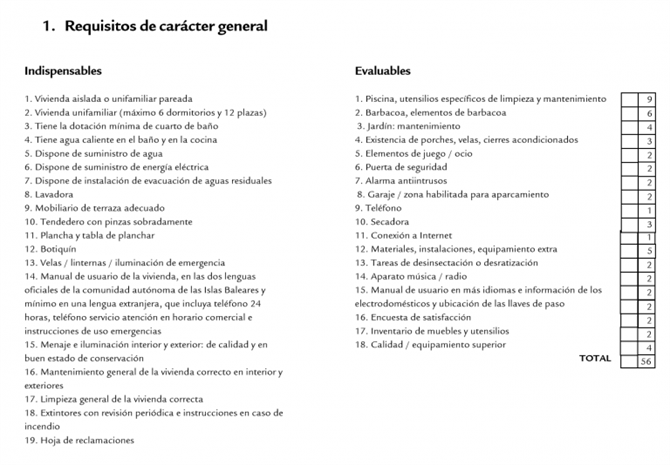 The following table summarizes the holiday rental licencing restrictions defined according to the tourist zones in Mallorca. (1) Whenever PIAT, or the current license suspension agreement, introduce restrictions based on seasonality to prevent holiday rental activity in the peak season summer months. In the event that the aforementioned license suspension agreement is not adopted or that the PIAT does not enter into force within two years of its implementation, or that any of these agreements does not introduce the aforementioned temporary measures, in any Zone 1, the registration of properties in the tourism registry for the commercialization of tourist stays will be prohibited. (2) When any of the areas defined as Zone 2 becomes declared a saturated and/or mature tourist zone, it will automatically become Zone 1 and the corresponding regulations will be applicable. In the event that within a maximum period of two years from the approval of this provisional delimitation, the PIAT does not come into force, in any Zone 2, it will be prohibited the registration in the tourism registry of houses for the commercialization of tourist lets. (3) Except where permitted by the PIAT or PTI. (4) Until environmental criteria and measures of sustainability, landscaping, heritage protection, agricultural activity support and recognition of the environmental contribution, and preservation of the landscape in any field are established through the appropriate agreement, holiday rental in zones classified as of common rustic land will be prohibited. This classification of zones in Mallorca is temporary until the Tourism Intervention Plan (PIAT) is definitely approved. The final approval of the tourist rental zoning by the Insular Council of Mallorca mean the end of the period of suspension (moratorium) on new holiday rental licences. What requirements does your home have to meet in order to be rented as a holiday home? 1. Have a current certificate of occupancy (cedula de habitabilidad) or similar occupancy certificate issued for this purpose by the competent insular Administration. · The maximum number of plazas that can be sold are those allowed by the certificate of occupancy. · These homes cannot have extra beds. 2. Be located in one of the areas declared and provisionally delimited as suitable for holiday rental activity. That is, when there are available tourist plazas from the “Stock Exchange (Bolsa) of Holiday Rental Plazas, and when the property is located in a tourist zone declared suitable for tourist marketing. 3. Be at least 5 years old. During this period the use of the home must have been private residential. 4. Be free from sanctions. A home cannot be rented as a holiday let if a sanction has been imposed for “serious” or “very serious” infringement of the holiday rental licencing laws until such time that the sanction has been fulfilled and the legality of the property is restored. 5. Have the corresponding relevant energy certificate for the property. · As a general rule, they must meet certain energy efficiency requirements, which have to be developed by regulation. o Rating F, for buildings constructed prior to 12/31/2007. o Rating D, for buildings constructed after 01/01/2008. 6. Have water consumption control systems (meters or individual meters). 7. Have individual counters for other supplies such as electricity or gas. 8. Comply with applicable sustainability and accessibility regulations. 9. Not be or have been, residential housing, subject to the regime of official protection or assessed price (precio tasado). 10. Have minimum equipment of 1 bathroom for every 4 plazas (occupancy rate). 11. Other requirements established in Annex 6 of Decree 20/2015. 12. Quality plans approved by regulation. 13. The houses are obliged to display, in a prominent and visible place, a plaque identifying the property as a holiday rental with the corresponding holiday rental licence number. In accordance with the specifications outlined in Annex 1 of the Decree 20/2015. 14. Civil liability insurance that covers corporal and material damages suffered by the guests during their stay and also by the community of owners. For a minimum amount of 300,000 euros. 15. 24-hour contact telephone number, available to the guests and also the community of owners. 16. Comply with the obligations imposed in the Tourism Law of the Balearic Islands, established for all tourism companies. 17. Comply with all regulations that may be applicable, including tax, and the regulatory requirements for the exercise of the activity (business, labour if you hire personnel, and tax). 18. Display the holiday rental licence number in all marketing material for the property, including online marketing. The guest must also be notified of the registration number at the beginning of their stay. 19. Registration of tourists with the Police in accordance with the citizen security regulations. 20. Comply with the information, prices, advertising and reservations regime that regulate art. 86 and 87 of Decree 20/2015. What requirements does your home have to meet if it is subject to the horizontal property regime (community of owners)? 1. In general, this refers to apartments or properties that are located in multi-family buildings. 2. Licences for apartments are granted for a period of 5 years renewable. Owners can apply for the renewal of the licence for a further 5-year period during the month prior to the end of the existing licence for holiday rentals, provided that the area where the property is located continues to be considered suitable, and the requirements for holiday rentals continue to be met. If the owner does not apply for an extension/renewal of the holiday rental licence before the expiration of the existing licence, then the licence will be revoked, and the owner will have to apply for a new licence, only if new licences are available to be granted. When the regulatory requirements established at that time expiry of the existing licence, including town planning, are no longer met, all holiday rental activity must cease, and the property removed from the holiday rental licence register. a) Tourist rentals will be allowed if expressly indicated by the statutes of the community of owners. b) In the event that the bylaws determine the property must only be used for residential housing, the bylaws must be modified according to the provisions of Law 49/1960, of July 21, on horizontal property. c) In the event that the bylaws do not prevent the holiday rental activity, an agreement of the board of owners will be necessary in which the majority of owners, who at the same time constitute the majority of property shares, expressly grant permission to rent out properties for short term holiday lets. The vote to agree to allow holiday rentals by owners of properties within the Community of Owners must be officially recorded and registered in the Property Registry. This agreement may also be modified by majority vote. a. You must inform the people in writing that they must respect the community rules and regulations and respect the basic rules of coexistence. b. You must also inform guests in writing details relating to the proper use of the services and the common areas and properties as outlined in the community rules and regulations so as not to cause damages to the rest of the people housed or to the neighbourhood. a. Sign to confirm that they have been notified in writing about the information relating to communal rules and regulations and public order as outlined in Part 4. Above. In case of serious infractions of the Community Rules and Regulations, the property owner has the right and power to request the guests to vacate the premises within a maximum period of 24 hours. What mechanisms are established to protect the rights of neighbours in the community of owners? To protect the rights of the residents of the community requires that guests staying in holiday rental properties located within a community of owners i.e. apartment block or urbanisation, have to sign the receipt of written information on the basic rules of coexistence. In addition, owner or rental manager must provide a 24-hour telephone contact number available for both the guests and community of owners in order to be able to report serious incidents that may occur. Licences for holiday rental properties located within a community of owners is temporary and must be renewed every 5 years (or the length of time set out in the current PIAT/PTI). It can only be renewed if the property continues to meet the requirements established in the Law and community regulations. What specific requirements do you have to meet if you want to rent the house where you usually live? The property owner (who resides in the property for the majority of the year) must marketing the property directly, and not via a 3rd party rental manager. The property is the main residence of the owner. The property can be rented out for a maximum term of 60 days a year. The home is located in a tourist zone that expressly permits rentals of this type in that area, as stipulated by the corresponding Island Council or by the City of Palma, in accordance with the provisions of the Balearic Tourism Law. The licence is granted for a period of 5 years renewable. In order to renew the licence, it is necessary to prove that the property continues to be the principal residence of the owner. The community of owners does not expressly prohibit the rental of properties for holiday lets in its bylaws. The property must meet the same requirements and obligations that are established for stays in residential holiday rentals in art. 50 of the Tourism Law, as outlined in the 20 points above. What are the minimum tourist services that you must provide to the guests? All holiday rental properties must offer, directly or indirectly, the following tourist services: - Periodic cleaning of the house, before the entry of new clients or during their stay. Supply of bed linen, towels, and household goods in general. Any other that can be determined through the Quality Plan. In the case of hiring personnel to carry out the services, the labour, social security and occupational risk prevention regulations must be complied with. How many bathrooms must your holiday rental property have? The property must have a minimum of one bathroom per every four guests. Since when is it possible to submit new applications for tourist licenses? From August 1, 2018 will be allowed the presentation of new applications for license (DRIAT) for all types of housing except for the apartments in Mallorca. Who can rent out a property as a holiday let? A property can be rented out for holiday lets as well as being used as personal residential property. What is the first thing you have to do if you want to rent out a property? Before marketing tourist stays in residential homes you must submit the corresponding declaration responsible for the start of the tourist activity (DRIAT) in which you show compliance with the requirements established in the current regulations, with registration to the Insular Council of Mallorca and Palma City Council, depending on where your home is located, and pay the corresponding fee. 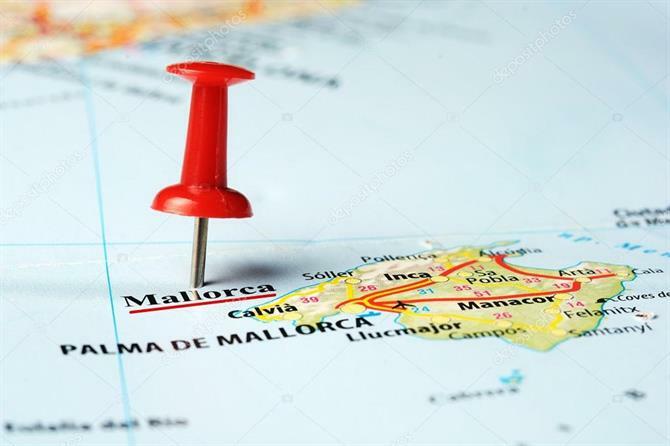 Only new declarations responsible for the start of commercialization of tourist stays can be submitted if they refer to a residential property that is located in the areas declared expressly suitable in the Tourist Zones outlined by the Insular Council of Mallorca and Palma City Council. What happens if you rent your home without a tourist license? Unregistered, illegally rented properties will be sanctioned with a fine of between €20,001- €40,000 for cases of advertising, hiring or marketing of tourist stays in residential housing that have not submitted the declaration responsible for starting tourism or prior communication. Additionally, the owner will be obliged to cease and desist renting out the property until the sanction and fines are resolved. What is considered an “illegal rental”? The marketing of holiday rental properties that have not presented their responsible statement (DRIAT) or do not meet the legal requirements for rentals. Both the owner, as well as the intermediary parties i.e. rental manager who markets the property or holiday rental platform, are responsible, and therefore liable, to ensure the property is legally rented out. How soon after presenting the DRIAT can you advertise and rent your tourist home? The presentation of the DRIAT enables you to carry out the activity of tourist accommodation from the moment you register your entry (it is presented), having effects of immediate inscription in the corresponding Insular Registry of companies, activities and tourist establishments. How can you present the DRIAT? 1. Online via electronic form. Go to Sede Electrónica > Relación de trámites > Inscripción inicio de actividad turística de estancias turísticas en viviendas. There you can complete, sign and submit the registration form of the administrative procedure for the declaration responsible for accessing or exercising the activity in the home for tourism purposes. To use the Virtual Office your computer must have a PDF document viewer installed. For this the electronic signature must be installed in the browser of your computer and have a compatible configuration. You can make use of the identification and electronic signature to carry out your transactions in a comfortable way over the Internet with full security and confidentiality. Unless the applicable regulatory regulation establishes the contrary, you can present the documents addressed to the organs of the Autonomous Administration in any of its registry offices. You can also submit them in the official registers of the island councils and of the municipalities attached to the framework agreement of integrated offices. You will find the addresses of all these offices here. In addition, you can also send the documentation by mail. In this case, you must present the documents in an open envelope, so that the staff of the post office can indicate, through the official stamp, the place, the date and the exact time in which the registration was made, data that they will also be recorded in the receipt justifying the presentation. Registration must be made online via electronic form only. What documents do you have to accompany with the DRIAT? Certificate accrediting the acquisition of tourist plazas. In the case of renting out a main residence (for 60 days per year max), a valid “empadronamiento” from the municipality indicating the property is the main residence of the of the owner. Documentation accrediting that in the community of owners the tourist commercialization is permitted within the bylaws of the community of owners (declaration that the statutes do not prevent the tourist lease). 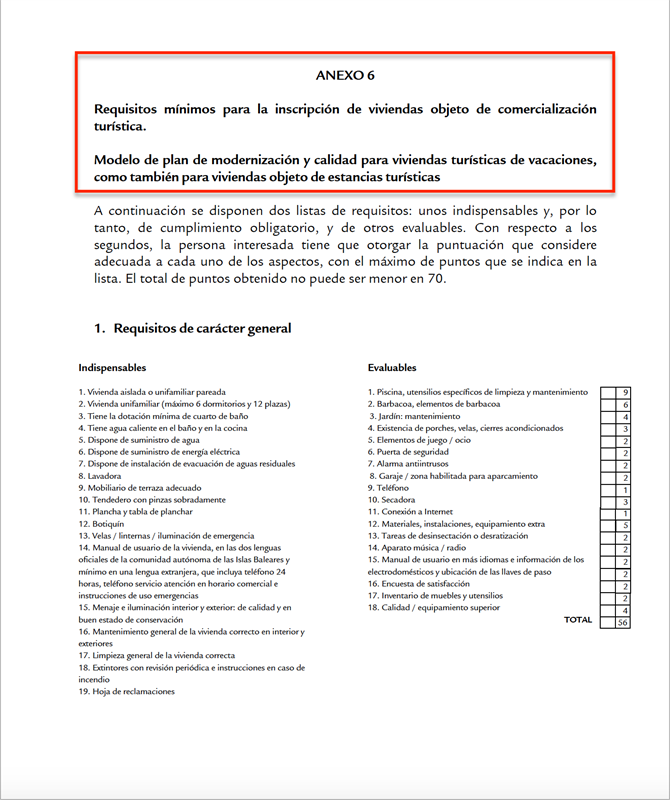 Completed Annex 6 form of Decree 20/2015 (see below) relating to the modernization and quality plan (Modelo del plan de modernización y calidad )for tourist stays. Payment of the corresponding administrative fees (tasas). This documentation can be presented in the register of the Ministry (Consejería) responsible for tourism or in any of the registers provided for in Law 39/2015, of October 1, on the Common Administrative Procedure of Public Administrations. Where do you present the application for the ETV? You can submit your DRIAT online via the Sede Electrónica of the Government of the Balearic Islands. The Sede Electrónica is a website that is available to citizens on the Internet and owned by the Government of the Balearic Islands (GOIB). What is the self-assessment for the Modernization and Quality Plan? In accordance with the Balearic Tourism Law and Decree 20/2015, of April 17, owners of holiday rental properties are obliged to carry out a modernization and security plan. The form covers two lists of requirements: some indispensable and, therefore, mandatory compliance, and others evaluable. With respect to the second, the interested person must give the score that he considers appropriate to each of the aspects, with the maximum number of points indicated in the list. How does the Modernization and Quality Plan affect you if you already have an existing holiday rental licence? If your home has passed a quality plan or system in the last 3 years since the publication of the Decree (April 18, 2015), which is in force. If your holiday rental property has been subjected to an inspection and verification of the plans within the last 6 years. However, in both these cases the self-assessment must be completed, and a modernization plan must be submitted at least every 6 years. If you do not resubmit your modernization and quality plan self-assessment every 6 years, the Tourist Administration will officially initiate proceedings to cancel your holiday rental licence. Do you have to include the registration number in the advertising that you make? Platforms or other marketing channels (defined as such for the first time in the law) are required to publish the license number of the home. This number corresponds to the final license granted by the Administration that has the competences of tourist management or, in case it has not yet been obtained, the registration number granted when the DRIAT was presented to a public registry. Do the holiday rental properties have to display a plaque? Holiday rental properties must be clearly identified by placing a plaque outside the property entrance, in a prominent and visible place. The plaque must show the letters "ETV" and the registration number. What happens if you do not comply with the regulations established once the DRIAT is presented? When inaccuracy, falsification or omission is detected in any data, manifestation or document that is attached to the DRIAT responsible statement, it will imply the suspension of holiday rental activity and also the cancellation of the registration. The cancellation of the registration will be considered definitive. Disciplinary proceeding will also be undertaken to demand the corresponding responsibility (possibility of a fine) from the interested party. Is it mandatory to sign a tourist accommodation contract? The tourist regulations of the Community of the Balearic Islands do not require a holiday rental contract as compulsory. If applicable, the contractual conditions set out on the website of the marketer that have been expressly accepted by the customer will be considered legally binding as a contract. Guests are bound by the current regulations relating to unsocial behaviour, breaches of ordinance relating to noise and other anti-social behaviour as outlined in the regulations and the community of owners’ bylaws where applicable. It is, however, recommended to draw up a holiday rental contract with clauses relating to the reservation regime and its cancellation, user withdrawal, prohibitions to users, provision of complementary services, penalties, repairs, maintenance, entry and exit of customers, deposit or bond for loss or deterioration of facilities, etc.